Watching Gulzar’s 1972 film Koshish the other day, I was reminded that even when a movie's tone is predominantly sombre, a light interlude can be effective and revealing. Koshish is the story of two speech-and-hearing-impaired people (apparently it isn’t politically correct to say “deaf and dumb" these days, though no one told the DVD subtitle-writers this) who meet, get married and negotiate the many challenges of their shared condition. Needless to say, this makes for a film with many emotional scenes, underlined by Madan Mohan’s insistently (and often effectively) melodramatic background score. And yet, there is an unusually whimsical, carefree moment early in the film. Hari (Sanjeev Kumar) and Arti (Jaya Bhaduri) are getting to know each other, going for walks together and so on. After watching a man talk into a public phone, they enter the booth and make prank calls – dialling numbers randomly, pretending to speak and listen. A succession of befuddled people answer the line at the other end, and finally there is a charming cameo: Dilip Kumar (presumably playing himself) walking down a stairway in a large house, looking around with mild annoyance at having to pick up the phone himself. He listens to Hari making incoherent sounds for a while, then mumbles “Yeh toh mujh se bhi maddham bolte hain” (“This guy speaks even more softly than I do”) and puts the phone down. Subtextual analysis aside, this sequence might seem frivolous, but I think it’s an important scene for the film because it shows us Hari and Arti in a light moment, sharing the sort of intimacy that they can’t share with anyone else – it’s almost like they are waggling their thumbs at the “normal” people who can speak and hear. It makes it easier to believe that these two can grow into a relationship together and that they will be able to have some fun too – that their married life won’t just be a litany of struggles. It shows a side to the relationship that we don’t get to see much of in the second half of the film, as things become increasingly grim. Koshish has a reputation as one of the more sensitive dramas of its time and indeed there are many good things in it, starting with the heartfelt performances of the two lead actors – Sanjeev Kumar in particular. (As old-time readers of this blog will know, I’m not a big enthusiast of Kumar as a self-consciously Serious Actor, but this role really is a tour de force for him – the movie would be diminished without his dignified, anchoring presence.) There are some lovely scenes early on, notably Arti’s initial turning down of Hari’s marriage proposal and her subsequent change of mind. Nothing is explicitly spelt out here for the viewer, but the impression I got was that Arti feels the proposal is motivated by sympathy – that Hari (who is more self-sufficient and worldly-wise) is offering to take care of her – but changes her mind when she sees him in a moment of vulnerability; she realises that they can look out for each other, that this can be a relationship between equals. But given all this nuance in the first half, I thought the film was compromised by the abruptness of its final 20 minutes and an unconvincing resolution where the protagonists’ son Amit is emotionally bullied into marrying a deaf and dumb girl (the daughter of Hari’s boss). It’s obvious that the idea here is to dole out a moral lesson – Koshish was made at least partly to raise social consciousness, and this ending is its way of telling the audience that handicapped people should be allowed the same opportunities as everyone else. And as a beacon for social attitudes, of course this message is appropriate. But at the individual level, surely it should be possible for a young man to turn down a proposal without having to endure his father putting him through a ferocious guilt trip and ordering him out of the house? (“Your mother and I had this disability too,” Hari tells Amit through sign language, “but we brought you up, taught you how to read and write, and this is how you repay us?”) Despite Kumar’s superb performance in this scene, the premise is shaky, and sends out very mixed signals about responsibility and obligation. Something else I found jarring: when Hari’s boss initially makes the proposal, Hari (who doesn’t yet know about the girl’s condition) firmly refuses, indicating in sign language that the gap in social status between their families is too large. This is an unedifying moment (to say the least) given that the film is shortly about to condemn discrimination in another sphere. 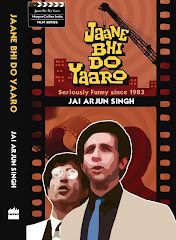 Basically, though Hari is stricken by his son’s reluctance to accept a speech-impaired girl for a wife, he himself has been attaching undue importance to the class divide – something that is a much less momentous factor in a situation where two people will be spending their lives together. It’s discomfiting to see how the power equation quickly gets reversed when the truth about the girl is revealed: Hari kisses her on her head and “accepts” her as his daughter-in-law; it’s as if disability has evened the scales between the two families, bringing the upper-class girl “down” to the level of the lower-class man. All told, I wish the issue of social status had been sidestepped altogether and the proposal had come from one of Hari’s colleagues. There is much to admire in Gulzar’s work as a filmmaker. He chooses atypical stories and subjects, has a feel for the arc of complex relationships between men and women, and when he’s emotionally invested in a scene it always comes across. ** But some of his work has a hurried, not fully thought out quality to it. I thought Koshish erred on the side of heavy-handed moralising when it could have spent more time showing the growth of the special relationship between its two central characters. In short, I wish there had been a little less preaching and more scenes like the phone-booth one. ** Given Gulzar’s strengths as a songwriter and his interest in music, I wonder if it’s facile to note that the song sequences in his films – Ijaazat and Aandhi come to mind immediately – are often shot more lovingly, with greater care and attention to detail, than the non-musical passages are. Watch the poetic use of dissolves and the synchronisation between visuals and lyrics in “Katra Katra”, for example, and compare it with the strictly functional camerawork and cutting in the other parts of the film. It was a long time ago when I watched this movie, but remember enough to talk about it. I too love the public booth scene. It adds a bit of lightness to the otherwise serious movie. Another scene that has remained with me is the one where Hari and Arti think that their son is born deaf, just like them. They rush to the doctor for a check-up only to realize that the rattle is broken and the baby is just fine. I don't know why this scene had such an impact on me that I still remember it. It could be the irony that it tries to show. I didn't find Hari's comment on the status divide unacceptable. It is perfectly natural for him to think so, being a middle class man himself. While the deafness is innate and something that you can't always change, social divide is man-made is completely reversible. 'Normal' people (non-deaf, I mean) don't take pride in their normal-ness when they see a deaf man, but rich people always see poor people with contempt. There is a difference in these two kinds of discrimination. Anamika: yes, the rattle scene is a very good example of the little fears and anxieties that people in Hari and Arti's condition would have to deal with on a daily basis. Puts the viewer right in their midst, so to speak. Have you written about Achanak somewhere ? Would like to know your thoughts on that movie, a very atypical Gulzar movie with no songs, that ranks as a movie that moved me immeasurably. बहुत सही पकड़ा आपने. गंभीर विषय पर फ़िल्म हो तब ऐसा कोई किस्सा उसके मुख्य स्वाद को और उभारता ही है. और ठीक यही बात पलटकर भी ऐसे ही लागू होती है. ’पीपली लाइव’ जैसी पूरी बात व्यंग्य में कहती फ़िल्म में भी एक प्रसंग ऐसा है जहाँ अगर ड्रामा के बीच जनता हँस देती तो पूरी फ़िल्म ही बैठ जाती. जब राकेश पलटकर पूछता है कि, "नत्था ही क्यों स्टोरी है, होरी की मौत क्यों नहीं? और सबसे ऊपर, अब स्टोरी बनाकर फ़ायदा क्या क्योंकि होरी तो मर गया." यह क्षण फ़िल्म की आत्मा है और नवाज़ुद्दीन अपने काम की ईमानदारी से इसे बख़ूबी निकाल ले जाते हैं. एक दोस्त ने ट्विटर पर कहा था, "it's nattha's circus but hori's story." well written. But Gulzar ji now a days only support arushi an ngo with lesser creditionals, unfair, not the ones who approach him. 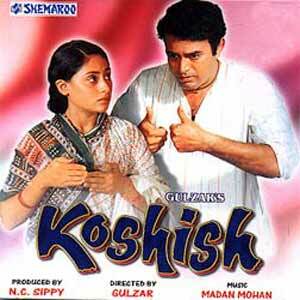 I haven't watched it for a while but Koshish used to be one of my favorite movies. Loved the little scene with Dilip Kumar. I guess people(parents) in that day and age were like that. It is not unthinkable that perfectly able parents would react the same way with the son rejecting their choice of bride. So to me it did not seem a stretch that physically challenged parents would react in this way when their perfectly normal son rejects a physically challenged bride. Also I guess the movie was made in a different age where individual was subservient to the social group/community that he lived in today I guess the individual is supreme and a filmmaker of today would make different choices in terms of his treatment of characters/situations. Overall I felt that Koshish was a sympathetic albeit a simplistic portrayal of the life of a physically challenged couple. The word is 'maddham'. Madhyam is a different word altogether. I am a regular reader of you blog but compelled to post a comment for the first time. I feel that you are analyzing the movie through present day glasses. For the period in time (those days) and social status of the characters both your judgment (about his son being forced to marry and class divide) on the movie seem to be misplaced. In earlier days a father would assert his choice on his son, as in present day a son can safely take a nice girl home and ask his parents for permission to marry and counter their opposition by saying "kya kharabi hai iis ladaki mein". And the one on class divide, it is apparent that Sanjeev Kumar has trait of sympathy in him for people with similar disabilities and he knows the difficulty such people face and he probably knows that even with such a status she will find life difficult and hence his agreement for the marriage. For once I did not find your comment on a movie unconvincing. I feel that you are analyzing the movie through present day glasses. But more seriously, I don't get this watertight distinction between how things were done then and how they are done today. Fact 1: there were some people, even in that social strata, 40 years ago, who would have defied their parents and asserted themselves (and there were parents who would eventually have given in). Fact 2: there are some people, even today, and in the most seemingly progressive communities, who are completely under their parents' thumbs in these matters. (You do know about "honour killings", right?) This past-vs-present divide isn't a clear one by any means. Also, I might be wrong about this, but in both your comments I sense an undertone of quiet respect for an idealised time when kids would toe the line and unquestioningly listen to their parents. But personally speaking I don't have much respect for that attitude, and naturally this colours my perspective on the ending. Even assuming that it was the "done thing" in the past, I don't think that justifies the emotional manipulation. More importantly, from a cinematic perspective, I thought the ending of Koshish was poorly done - it was much too abrupt and sketchy, and the film's suggestion that Amit is eventually happy with the decision isn't at all convincing. The last shot feels like a very hurried attempt to reach a happy ending. If the film had found a way to convincingly portray Amit's change of heart (perhaps by giving him a scene or two with the girl), it would have worked much better. Nightwatchmen: no, haven't seen Achanak (probably did when I was a child but don't remember it). Will look out for it, thanks. "..sense an undertone of quiet respect for an idealized time when kids would toe the line and unquestioningly listen to their parents". No, I do not respect that era or attitude. I myself haven’t “toed the line”. All I wanted to point out is that while you and I may disagree vehemently with the choices the character makes in a movie it does not necessarily follow that it was bad character development, script or direction or filmmaking. I agree overall with you that in Koshish the last third of the movie is not in keeping with the overall tone and pace of the movie and I do not thing it is anything other than a merely good movie with some nice moments. I am just quibbling over the suggestion that you did not like the movie because you did not like the way a character behaved. All I wanted to point out is that while you and I may disagree vehemently with the choices the character makes in a movie it does not necessarily follow that it was bad character development, script or direction or filmmaking. Oddan: completely agree - I should have been clearer about this in the post. Like I said in my last comment, the main issue isn't the worldview being portrayed but the disjointedness of the film's climax and ending. On the other hand, the worldview does in a way contribute to the slapdash ending. I am just quibbling over the suggestion that you did not like the movie because you did not like the way a character behaved. Understood. Though I haven't said anywhere that I didn't like the movie! Its pretty realistic even today for class differences to matter a lot in arranged matrimony. I think the boss *was* trading social class against disability and SK's character also must have intrinsically accepted it. Not the way things "ought to be" today or yesterday either.No problem pointing it out either. But just the way it was and still is in places. It seems to me that when we look for "realism" we want to look for gritty gaalis etc. but not a good portrayal of internalized biases or belief systems (or at least we want the movie to hold them up in overt disapproval). The reason for not using the phrase is the word "dumb" and "deaf and mute" is much more acceptable. It is because once people thought that because somebody couldn't speak, that person was "dumb" (less intellegent or stupid), which is not true. Sunil: oh I didn't say "deaf and dumb" should not be used, I said it isn't politically correct to say it these days. I've written elsewhere about how annoying it is when a word/phrase is replaced by another, more "acceptable" one, only for the replacement to eventually become equally tarnished because of association with regressive/prejudiced attitudes. The frequent changes can be tiresome for people who used the original phrase without any malice in the first place. Having said that, yes, "dumb" is a problematic word in this context. By the way, these days "mute" would be confusing because we tend to associate it more with our TV or computer controls! Jai_C: as I clarified in an earlier comment, I didn't think the ending was a convincing portrayal of the characters' social conditioning/belief system. Hari's outburst at the end followed by Amit quick turnaround was much too pat and abrupt. That was the major problem. This is a common trait amongst Indian (read Bollywood) film-makers where some of them dare to take on challenging subjects, but succumb at the last minute to box-office performance pressure by providing a more popular ending. I watched the film Swades a few days ago and observed a similar ending. The film-maker, for 2.5 hours, presented an issue - a very realistic one, but then hurriedly wrapped up the film with a *popular* decision that the lead character takes to return to the village in India by bidding farewell to a successful NASA career. The filmmaker would have thought that if he had made the protagonist practical and made him choose his career at NASA, the general audience will not like the ending resulting in poor performance at the box-office. I feel that an even better ending would have been to keep an open ending as there is not easy solution to the issue at hand. On the contrary, and not to compare, in the movie "Ordinary People", the filmmaker chooses a realistic and non-happy and non-melodramatic ending where the family that lost a member does not live happily ever after. This is where the filmmaker chose to dare take a difficult subject, and stuck with it. As long as a realistic story that addresses realistic issues tries to please the general audience the story will never turn into a gem. I love reading your blog. Great job! Wasn't Koshish based on a Japanese film? I remember reading that somewhere. I recall many vignettes from the movie, though I was just a kid when I saw it. SOmehow I recall Aarti as refusing Hari because she wasn't sure he could look after her, then he shows himself to be assertive and capable and she changes her mind. You said she saw his vulnerability, so I must be confusing the scenes in my mind. I remember feeling really sad when their child dies due to Asrani's burglary. And I remember Asrani - after seeing him playing only bufoony roles, it was quite unusual to see him playing this negative, exploitative role. Yeah, the ending jarred even as a kid. I recall feeling annoyed at the emotional blackmail by Hari - he chose a soulmate with whom he could communicate, but denied his son that privilege from some kind of misguided philanthropic drive. Somehow I recall Aarti as refusing Hari because she wasn't sure he could look after her, then he shows himself to be assertive and capable and she changes her mind. Radhika: well, that's a valid interpretation too - there'a a nice ambiguity to the scene where Hari (already upset about Arti having turned him down) strongly berates two men who were laughing at him. Ajay: not sure about the distinction you make between "realistic stories" and popularism/catering to a general audience (there are occasionally happy endings in the real world too!). What matters, I think, is that the ending - whether it's audience-pleasing or not - should be internally consistent and believable given the arc of the story up to that point. Quizman: the Nanavati case has been written about very interestingly in Gyan Prakash's book Mumbai Fables, btw. Enjoyed Koshish a lot. Very good film. Dilip Kumar had seen Sanjeev Kumar in same frame in Sangharsh. He admired Sanjeev Kumar's acting abilities then also and gave him a gift on his good performance. Both were very good actors. As expected, your post augmented my view point on the film :). Enjoyed reading it. I remember being in full sync with you on Sanjeev Kumar's acting abilities, I think I commented on your blog some years back that I have never been convinced of Kumar's so called great acting talent. (I am in life threatening minority here). Even when you talk of Koshish, I think he seems convincing because he plays a mute character. An actor can only claim to be good if he can speak his dialogues with a finesse typical of great actors and not sound jarring,raucous or clownish on the ears. (A recent example of our times excelling in jarring delivery is Farhan Akhtar,but that is a discussion for some other time). In Kumar's case it was more of the latter. His constipated attempts at trying to sound different while mouthing his lines were studies in high camp. I don't mean to sound pompous or contemptuous but would just like to present my honest opinion. The reason why I am commenting on such an old post is that while Koshish was a decent movie and Kumar was bearable because the role was limited i would still not call his performance superlative . One main reason for this could be the torture I have endured at my colleagues and friends passionate orgasms on his being a great actor but on a serious note I have never been taken in by his so called great performances in other films.